Have a question? Drop us an Email. Need directions or want to call us? Check out our contact page for driving directions and other contact information. 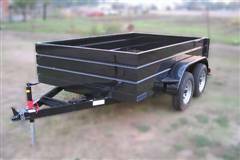 Note: Light Weight Dump Trailers are not meant for industrial grade work, Heavy Duty Units Are. Your choice of available colors.